Senior running back A.J. Barner rushed for 103 yards and three TDs and caught a team-high seven passes for 77 yards in Friday’s 28–14 non-conference win at Cuba City. POSTED August 24, 2018 3:49 p.m.
CUBA CITY — A new year, a new quarterback, a new player maker, 10 new starters and a new defensive scheme. On paper it sounds like the Platteville football team is in for an bit of an adjustment period this fall, but so far so good. Friday night’s 2018 season-opener was certainly a testing out period for the new-look Hillmen, who are coming of a 9–2 season and a second straight Southwest Wisconsin Conference championship. All the newness added up to an uneven — and at times sloppy performance — but in the end second-year head coach Ryley Bailey’s Hillmen opened the year with a determined 28–14 victory at Cuba City. The newest Hillmen star was senior running back/wide receiver A.J. Barner, who stepped into a dual-purpose go-to role Friday night after missing five of Platteville’s 11 games a year ago as a junior. 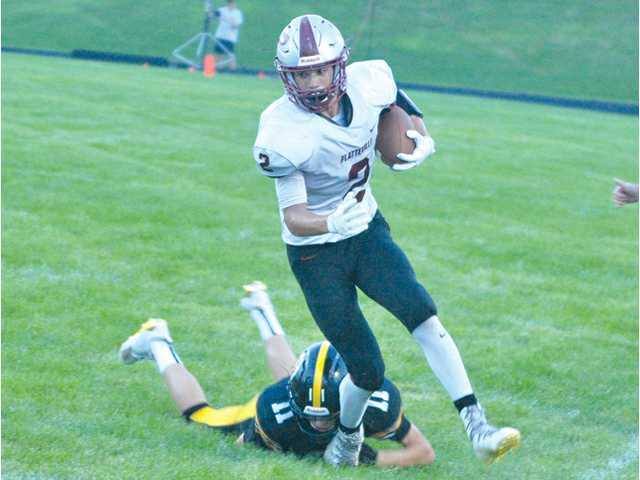 Friday night he led Platteville in both rushing and receiving and scored three touchdowns. Barner finished with a game-high 103 yards rushing and three 1-yard touchdown runs on 23 carries. He also caught a team-high seven passes for 77 yards and ended a third-quarter Cuba City drive with an interception at the Hillmen 20-yard-line. New Hillmen quarterback, junior Tyler McClain, completed 19 of 27 passes for 183 yards in his first varsity start replacing record-setting WFCA All-Star Ethan Bernhardt, who finished his career with 4,333 yards passing and 56 TD passes. Platteville drove to the Cuba City 26 on the opening drive of the game, but a fumbled snap and a fourth down sack by Cuba City senior Mason Reuter forced a turnover on downs. The Cubans drove 64 yards in four plays — 36 coming on a first-down pass from senior QB Andy Clendenen to sophomore Blake Murphy and 21 more on a Clendenen run — and took and early 7–0 lead on a 1-yard plunge by Reuter. Platteville responded with a four-play, 67-yard touchdown drive of its own. McClain tossed a 30-yard strike to senior Austin Wein then connected with Barner for a 34-yard gain down to the Cuba City 1. Barner took it over from there, but Platteville missed the extra point and trailed 7–6 with 3:21 left in the opening quarter. The Cubans drove to the Hillmen 10-yard line on their next possession, before the Platteville defense pushed back. But Clendenen launched a 27-yard toudown pass to fellow senior Jake Langmeier on 3rd-and-goal to make it 14-6 three minutes into the second quarter. Clendenen finished 13 of 29 passing for 159 yards. The teams traded punts on their next possessions before the Hillmen tied the game just before halftime. McClain connected with senior Jake Niehaus for a 19 yard gain on 4th and 8 to move the Hillmen inside the Cuba 5, then two plays later Barner burst through the middle of the line for six. Niehaus then completed the conversion pass to senior Connor Riley to even the score at 14 with 27 seconds left before halftime. Platteville grabbed the lead for good less than a minute into the third quarter. Senior Carter Chitwood recovered a fumble at the Cuba City 33 two plays into the second half. Niehaus then tossed a 33-yard touchdown pass to Riley, and senior Quinn Kafar’s extra point made it 21–14. The Hillmen defense held the Cubans to 62 yards the rest of the way forcing four punts and interception and a turnover on downs on Cuba’s final six drives. Riley finished with a team-high six tackles. Schaefer and Kafar were each in on five stops. “Our defense in the second half had a great team effort and did their job consistently to slow down Cuba City On the defense. Will Schaefer and John Goomey played like men,” added Bailey. The Platteville offense burned more than six minutes off the close late in the fourth quarter and put the game out of reach on Barner’s third touchdown run of the night with 1:46 remaining. NEXT: The Hillmen will host Columbus Friday at 7 p.m. at UW–Platteville’s Ralph E. Davis Pioneer Stadium. The Cardinals (0–1) opened the season with a 21–14 loss to visiting Omro last week. First downs — P 21, CC 12. Rushing — P 37-128, CC 18-38. Passing (comp-att-int, yds) — P 20-28-0, 216, CC 13-29-1, 159. Fumbles–lost — P 1-1, CC 2-1. Penalties-yards — P 12-80, CC 5-50. Rushing — P: A.J. Barner 23-103, Carter Chitwood 5-24; CC: Mason Reuter 5-26. Passing — P: Tyler McClain 19-27-0-183, Jake Niehaus 1-1-0, 33; CC: Andy Clendenen 13-29-1, 159. Receiving — P: Barner 7-77, Connor Riley 2-43, Ausin Wein 6-40; CC: Jake Langmeier 6-66. Tackles — P: Connor Riley 6, Quinn Kafar 5, Will Schaefer 5.